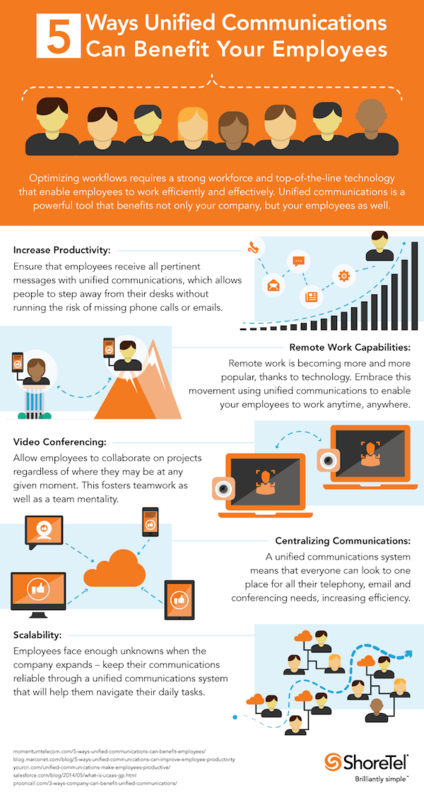 There are many different types of unified communications and collaboration tools. These types of tools include things commonly used in any and every business structure, like instant messaging, conferencing applications, teamwork applications, video conferencing and mobile applications. But, they also include lesser-known tools like presence, which allows you to know whether contacts are busy or available, and unified messaging, which makes it possible to retrieve all your messages in one centralized location. These unified communications tools are some of the most prevalent in business and are certainly products you should familiarize yourself with. After reading this graphic and finding out all the ways this method could help your business, you probably want to know how to implement it for everything from employee tracking to day-to-day operations. Thankfully, there are plenty of options available to business owners like you. Top companies offer their services with additional features and support, too. So you can experience all the benefits of unified communications without worrying about doing it all on your own. These providers will help you through implementation step-by-step, answering any and all questions you have throughout the process. They will also help you to decide which solutions fit your business best, so that you can be certain you are making the right decision for your business. If you want to bring your business into the 21st century with unified communications and collaboration, consider visiting a provider’s website. Then, start reaching out to a representative for advice and guidance on how to cut costs on start up for these services. Unified communications helps businesses in implementing web, video and audio conferencing solutions. For e.g. deploying web conferencing servers helps businesses in cutting down travel costs, solving problems, expanding business by interacting with multiple clients at same time etc.